What's New @ Roselle Public Library: Decorate the Mitten Tree! 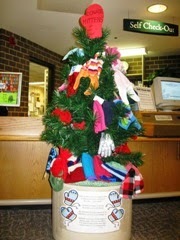 Bring NEW mittens gloves and hats to the Circulation Desk to Decorate our Mitten Tree. All items will be donated to the Bloomingdale Township General Assistance Office which will distribute them to families in need in our community. Donations will be accepted throughout the entire month of December. Roselle Public Library is located at 40 S. Park St., Roselle. Call 630-529-1641 x *222 for more information.